The children have been SO looking forward to preparing for St. Hilary's Patronal Festival this year! The vicar made them chuckle when announcing this special service by telling them something he knew would make them laugh about St. Hilary of Poitiers. He told them that he was sometimes called "Hilarius"!! Needless to say the children we so amused and inspired that they were immediately looking forward to their patronal festival! 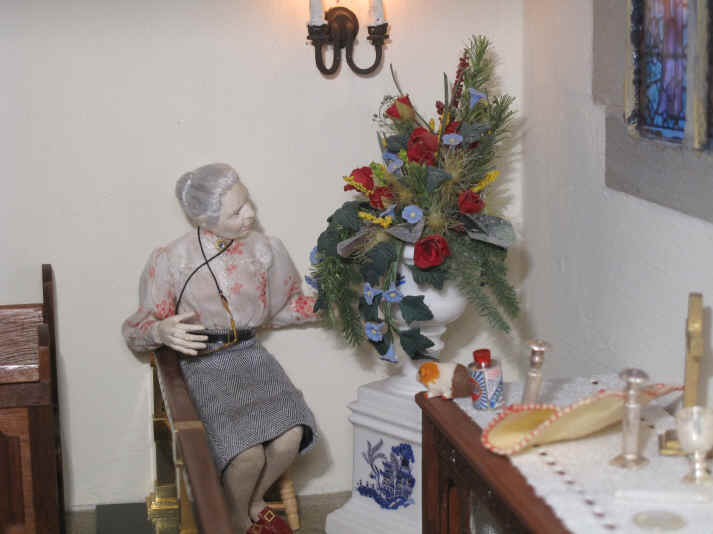 Miss Enid is just adding the finishing touches to the floral display in the sanctuary. Hasn't she made a beautiful arrangement? She is checking to make sure there are no last minute adjustments required. GP, Gracie's pet guinea pig is really settling into St. Hilary's isn't he? He is so enjoying joining in all of St. Hilary's activities whatever they are. He too thinks Miss Enid has done a really GREAT job! Someone has left a duster and a bottle of Silvo on the altar. They haven't even finished the work have they because the silver candlesticks have not got the candles in and the candles have been left lying haphazardly on the altar. Who IS the culprit here? It was Emily! 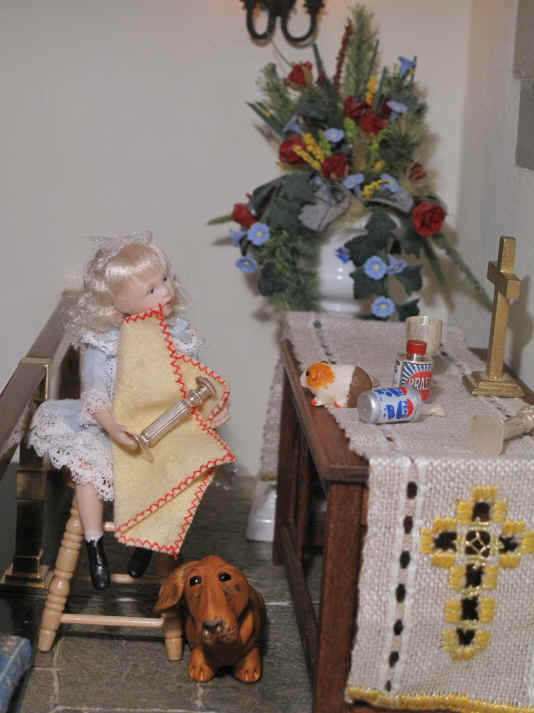 She had taken a little break from her job given to her by Miss Enid to clean the altar silverware. Although she is back now, she had decided that she was too thirsty to carry on so had to fetch a can of cola from her provisions bag. However...........WHAT has happened to it? It has fallen over after she was not very careful putting it on the altar. She should never have put it there in the first place of course but at least it WAS empty. Emily is feeling bored as you can now see and, instead of finishing the cleaning of this candlestick is preferring to have a little chat to GP instead! WHAT is Robert Alexander doing here? Would you believe it! 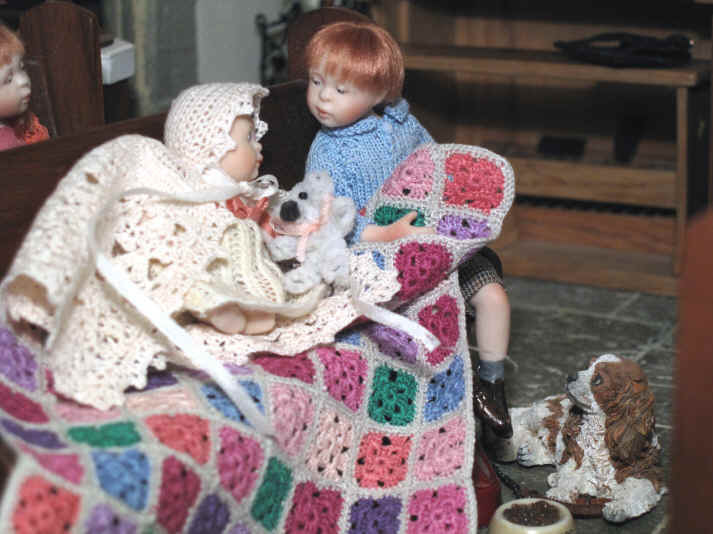 He wants to take baby Clarissa's lovely warm blanket off her just because he wants it for something in the Patronal Festival. She is NOT happy because it is a VERY cold Winter's day today! It has even been snowing and is very icy outside. The vicar has already told them that the theme for the Patronal Festival is that of "The Good Shepherd" because it reminds them all that St. Hilary of Poitier, their church's patron saint, was made a bishop and, as so, was also a shepherd of his flock just as Jesus was the shepherd to His flock, ie His disciples and all who believe in Him. Robert Alexander has been asked to do one of the readings and guess what the reading is...............the story of "The Good Shepherd" taken from the gospel of John (Ch 10 v 11-16). Poor baby Clarissa Elizabeth.........she really does NOT look happy at all. Georgie too looks quite concerned as she listens to Robert Alexander's demands of Clarissa. Can you see that Robert Alexander has brought Georgie's dog food and bowl to church? 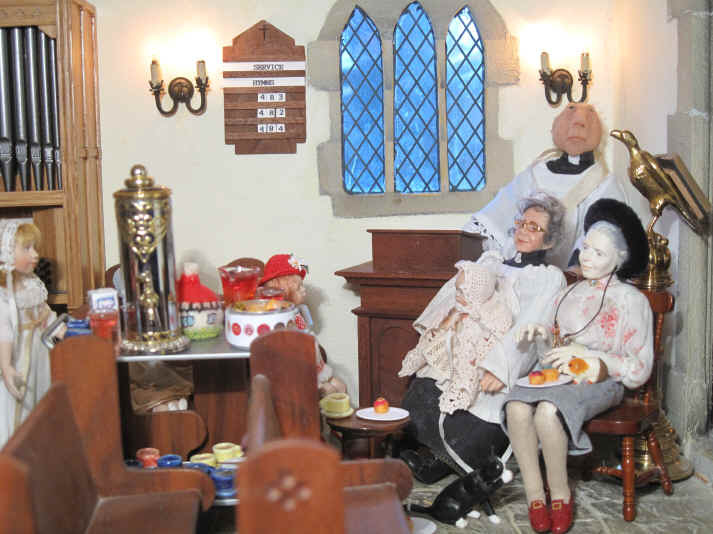 The vicar will not be very pleased when he arrives and sees this! Here is the vicar at last. Robert Alexander is telling the vicar that he had so much fun dressing up as a shepherd for the Advent Calendar photo he fancied doing it again today! The vicar does NOT look too happy does he? He is telling Robert Alexander to give poor baby Clarissa back her warm blanket or she will get cold very soon. The vicar is still happy for Robert Alexander to read the lesson but he is telling him that it is not important to dress up for the occasion. As long as he makes sure he reads clearly and that everyone can hear the story that Jesus IS the Good Shepherd who will always look after all of His people just as a good shepherd looks after their sheep at all times. Robert Alexander is relieved to know that the message was more important than dressing up especially since he now knows how much he upset poor baby Clarissa and made her cold! He runs around to Clarissa in her pram and gives back her blanket.........good boy Robert Alexander! Its a good job for Robert Alexander though on another front..........plainly the vicar has not noticed Georgie's dog bowl with food in it..............phew..........!! 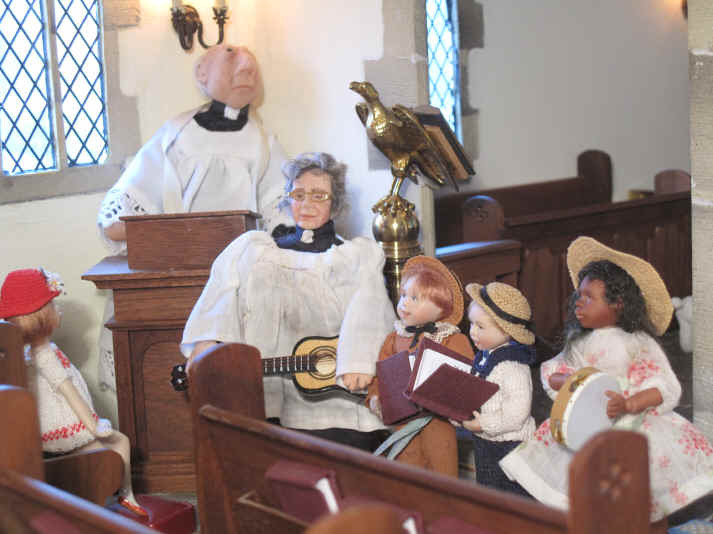 Rev Ken has started a little music group with the children! 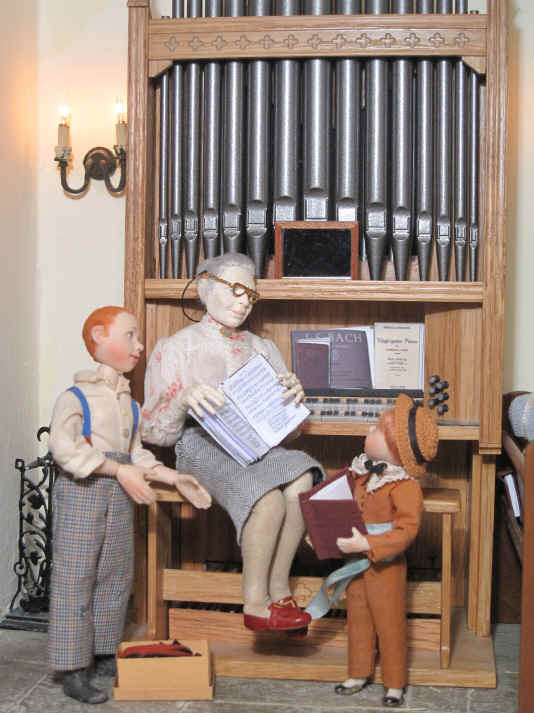 It was Gracie who wondered if St. Hilary's could have one because she belonged to the music group in her last church. She SO enjoyed playing her tambourine during the choruses they used to sing! See her here........with her tambourine of course. They are leading the singing today and the hymn they are helping the congregation sing is........."For all the saints" because, of course, they are celebrating a saint, THEIR patron saint, St. Hilary of Poitiers. Miss Enid did help before the service though and went through it with them so that the children didn't stumble on the words during the service. However can you see that one young man has not even got his hymn book open? It is Ben. He obviously THINKS he knows and remembers all the words well enough to sing it off by heart. However, as they start to sing one little voice carries over all the others including the congregation as HE sings................."For all the saints who from their NEIGHBOURS rest"! Oh dear...........that really does NOT sound right does it? There are no prizes for guessing WHO the culprit is...............Ben of course! Miss Enid looks SO severe as she calls Ben over to her after the service has finished. 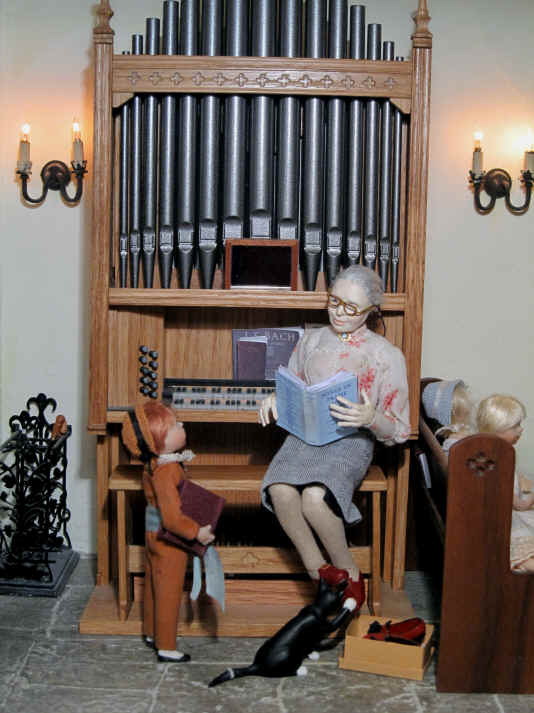 She was not at all happy to see him singing without looking at the words in his hymn book. She was especially unhappy because he has such a lovely singing voice and she suggested to Rev Ken he would be a great asset to the new music group as one of the lead singers. She says she must put her glasses on first but there is something she needs to point out to him. Ah.......here it is.........the very hymn. She shows Ben so that he can see that he where he went wrong. He SHOULD have sung......."For all the saint who from their LABOURS rest". Poor Ben is immediately mortified when he realises how wrong he was. He is promising Miss Enid that he will always make sure he has the music and words with him when he sings again. Miss Enid was secretly amused though when she heard his little voice shouting above the rest and getting it so so wrong. After all.......................she has sometimes felt that she would like to have a rest from HER neighbours when they are making a lot of noise next door or.........well anything that she finds annoying. However, as she tries to remember,...........God loves us all whatever we do.........EVEN our neighbours when they annoy us! 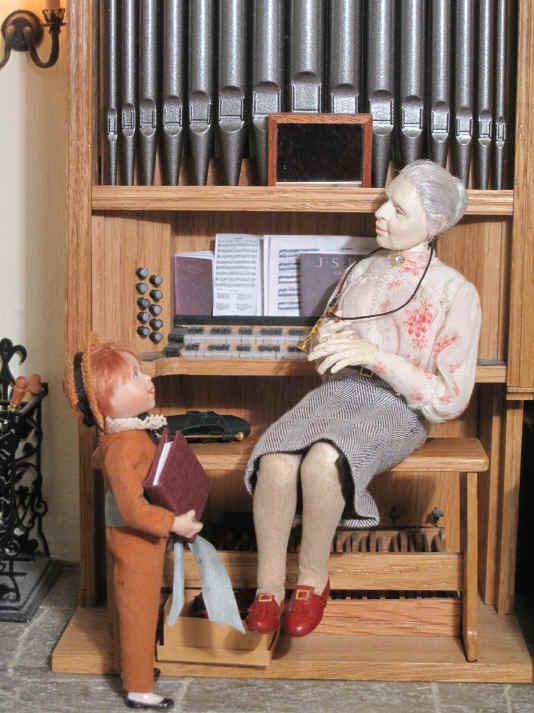 She also wonders if SHE sometimes annoys them too when she practises some of her organ pieces at home on her piano. However they have never come and mentioned it to her so perhaps, like her, they understand her need to practice the piano as much as she tries to be tolerant when their children make a lot of noise playing inside the house. Guess WHO brought these lovely little cakes in for some special after service refreshments? It is none other than our new girl, Grace and why..............because they are Gracie cakes of course! 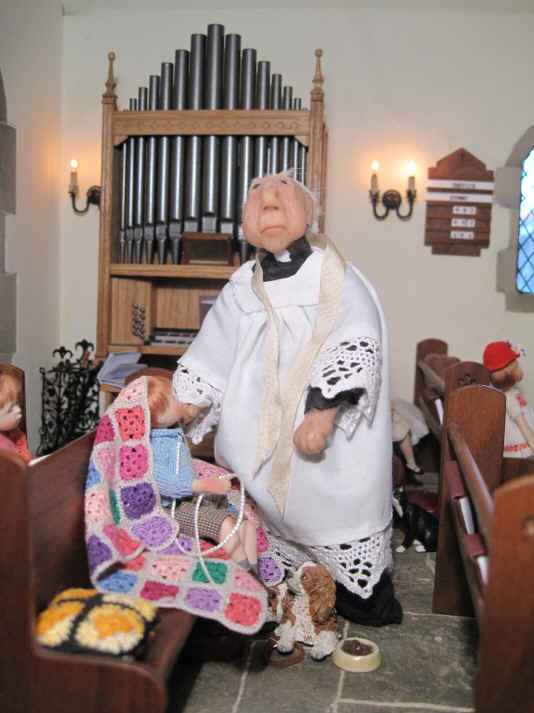 Rev Ken is having a relaxing time whilst nursing his baby daughter, Clarissa. Miss Enid is enjoying a couple of Gracie cakes .............with an unexpected new competitor for them..........GP! GP is Gracie's pet guinea pig and he is just as addicted to "Gracie cakes" as the children! Tinker, ever hopeful, wouldn't mind a Gracie cake all to herself too! Miss Enid was feeling rather cold during the service so she has put her lovely warm hat on her head. The heating is not so good in St. Hilary's on cold days and with the snow and ice with below freezing temperatures at the moment it can hardly cope. 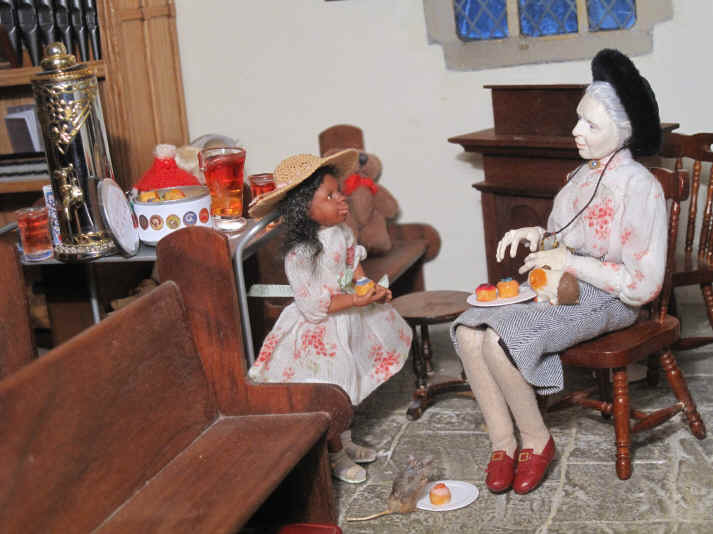 Grace wonders if Miss Enid wants ANOTHER "Gracie cake" but Miss Enid is telling her that she feels quite full up now even with GP competing for them! Gracie is a very kind girl as you can see because she has put a paper plate and "Gracie cake" on the floor for Sepp too after realising how much he and Snowy loved them at one of the Games afternoons. Read more about St. Hilary of Poitiers here. Many thanks to Frances Rautenbach for this link. This story was inspired by a real choir boy Andrew and I knew in our work who really DID read the hymn out and got it so so wrong.........needless to say we howled with laughter when he read it to us...........AND very seriously too as young children are!